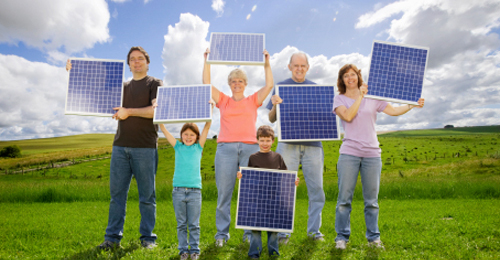 Solar energy for the home is an efficient and eco-friendly energy solution. Solar panels allow homeowners to generate their own electricity using the sun. Systems are easy to install and can lead to lower energy bills, as well as generate income from selling surplus electricity. Solar panels or photovoltaic (PV) systems are made from layers of semi-conducting material such as silicon. Cells create an electric field across the layers. Panels do not require direct sunlight, only daylight to generate energy. The more daylight, the more electricity is produced. Electricity then flows through a cable in the panel and is collected at a central point, which is generally located in the roof space or loft. At this point, energy is converted from DC to AC current and fed into the home's electrical system. There are two main types of PV systems: built-in and add-on. One or more panels can be mounted on a building's existing roof. Alternatively, solar tiles instead of regular tiles can be fitted when installing a roof. Solar tiles or slates are generally used when solar panels are deemed to be not appropriate for planning or aesthetic reasons. The typical PV system is four kilowatts peak (kWp), which is the unit of measurement for the power of a solar panel or tile. Introducing solar electricity into a home or incorporating it into the design of a new house can help cut energy costs. Once the initial installation is paid for, costs will be significantly since sunlight as an energy source is free. Homeowners with solar panels can also be paid for the electricity generated by their solar panels with the UK government's Feed-In Tariffs scheme. Homeowners can also sell surplus electricity back to the grid. Solar electricity also cuts a home's carbon footprint since it is a renewal energy source that does not produce harmful carbon dioxide (CO2) emissions and other pollutants. According to the Energy Saving Trust, a home solar panel system can save more than a tone of CO2 annually or 30 tonnes over its lifetime. Solar panels and tiles come in various sizes and shapes to suit any type of home. In most cases, installing solar panels does not require planning permission. Since solar panels use a home's existing electrical system, new wiring is not usually needed. The average solar panel system costs from £6,000 to £9,000, according to the Energy Saving Trust. Installation costs will depend on the amount of electricity the system is designed to generate. Although they are more expensive, larger systems are typically more cost effective and give homeowners the potential to sell electricity to the grid. A system built into a roof is more expensive than installing panels on top of an existing roof, and PV tiles cost significantly more than solar panels. Once installed, PV systems require little maintenance. Panels must be kept clean and free of debris, dust, bird droppings and anything else that may cover the cells. Warm water with or without a cleaning fluid can be used to remove any debris or dirt. Certain service providers may offer professional cleaning, although homeowners can often do the job with a brush or high-pressure hose. Trees may also need to be trimmed if they are casting shadows on the panels. Panels typically last 25 years before a replacement is needed. The average replacement costs approximately £1,000, according to the Energy Saving Trust. The Green Deal helps reduce the cost of installing solar panel systems and encourages the use of efficient energy solutions. The initiative provides financing to help with introducing energy-efficient improvements to a home through cost savings on energy bills. Some solar panel systems may also be eligible for the government's Feed-In Tariff, which can provide savings and income of approximately £770 per year.